Ingleborough is England's finest mountain. Of course, that is my biased opinion, but I also know many others who would willingly second it. Once thought to be the highest peak in the country, this magnificent feature of the Pennine landscape has everything: a stunning profile, wonderful history, textbook geology with its beautiful plinth of Great Scar Limestone; rugged slopes, near vertical in places, and, of course, scores of awe-inspiring caves and potholes unmatched anywhere else in Britain. Add to that an exposed position on the very edge of the Pennines, visible for miles around, and you can understand why 'The Beacon' or 'Fire Watchtower' is of world importance as a mountain, even though its summit lies just 2337 feet above the sea. After 40 years of loving the Dales, I can't think of them without thinking of this great mountain. The two go together. You think of Yorkshire limestone ... and you think of Ingleborough. Let no-one ever kid you that the other two, spectacular as they are ... are better than this. They are only kidding themselves. Today I set off to climb Ingleborough by a thrilling, pathless route up the Falls Foot landslip. This is my favourite way to the summit: a lonely route where isolation adds to the magnificent scenery all around. I left the layby just above the Hill Inn in Chapel-le-Dale. We'll let them off with the 'Old Hill Inn' as a name, shall we? It's a very old pub, and the name trips off the tongue. 'Mountain Inn' wouldn't quite do that, would it? Just behind the inn, a series of huge limestone boulders give away that the valley was once occupied by a huge glacier. These were dropped off some 12,000 years ago! My route headed south west along the limestone plateau on which the mountain stands. After the wonders of Meregill Hole, I headed onto Raven Scars and dropped down to a very special and secretive cave. After that, it was a case of all systems go - back up the terrace with awesome siuations, and then the amazing exposed climb up the huge landslip of Fall's Foot to the summit. From the start to the summit using my route - I met two people, having a picnic by a cave entrance. From the summit downwards I met scores - all looking exhausted and a little fed up. 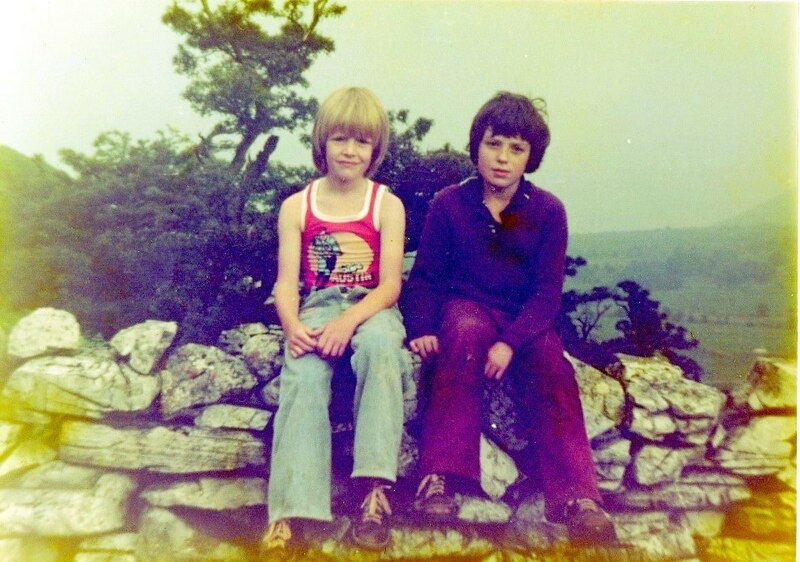 For all of them, Ingleborough was just another summit: the last one of the three. Great shame in a way, though I admire their stamina. Each to his own! An attractive view of the farmstead of Low Hill presents itself on the right, with cloud shadows projected onto the lower slopes of Whernside, across Chapel-le-Dale. Whernside rears its head as the highest of the Three Peaks: the culmination of a four mile long ridge between Ingleton and Ribblehead. The classic 'u' shaped glaciated valley of Chapel-le-Dale. The width of the glacier, which melted around 12,000 years ago, is evident on this photograph. The glacier effectively bulldozed away the upper layers of rock to leave the limestone benches exposed as the finest in the UK. At far left are the Raven Scars - which I explored on my adventure, while the famous Twisleton Scars are on the right. Millions of years ago the limestone on both sides of the picture would have been connected as one continuous plateau. Harry Speight (1892) in his classic work The Craven and North West Yorkshire Highlands, stated that there are more individual natural wonders in Chapel-le-Dale than anywhere else in Britain: pavements, caves, potholes, waterfalls and geological wonders are the hallmarks of this truly amazing place. All the water resurging from the caves on the left of the picture emerges as a rising at God's Bridge, which is in the valley floor at left centre. From there, the river flows down towards Ingleton and its famous waterfalls. Some don't care about the wonders: it's the grass that matters - right? The hamlet of Chapel-le-Dale itself lies at bottom right on this photograph. Above it, the Yoredale slopes of Whernside can be seen gently sloping down to meet the Great Scar Limestone plateau on Scales Moor, with Gragareth peeping in the distance. The terraces of Twisleton Scars are four miles long and are unmatched anywhere else in Britain. A very thin layer of glacial till (debris) can be seen on the wooded slope just above centre behind the barn, where the limestone has been plastered by material from the melting ice. The ice could be creative as well as destructive: like, for example, when it dropped this group of fellas, huddled together in eternal conversation - or a least until the next glaciation! Our first view of the 'compelling presence.' The final thousand feet of Ingleborough is, like Whernside and Penyghent, composed of a 'sandwich' of shales, sandstones and limestones: the well known Yoredale Series. The huge Great Scar Limestone plateau on which it stands was laid down some 340 million years ago in a warm, shallow, tropical sea. Amazing to think that the rocks around the hawthorn were once living creatures in a warm lagoon! When conditions eventually changed, the sea levels began to fluctuate. When very shallow, muds would be laid down to form shales, and when slightly deeper, great rivers would wash in sand and gravel which eventually formed the sandstone layers. Limestones in between were, of course, laid down when the water levels were deep enough for the little critters to flourish. That massive Yoredale layer will, of course, have covered the entire foreground of the photograph but has been removed by a series of glaciations, leaving one magnificent 'lump' for us all to admire in the one and only Ingleborough. Thankfully for us, the glaciers exposed the bare white limestone benches adding a contrasting splash of white to the sombre tones of the Yoredales above. This view is of the Southerscales bench, looking to Whernside. Cairns are built to mark the eges of the scars, so that, in mist, people don't go and topple over the edge. The line of trees cutting left to right just above the tip of the cairn marks an area explored in my 'Wandering under Whernside' adventure. Another cairn, this time looking south west across to Twisleton Scars and the huge white pavements of Scales Moor. Before the rivers and glaciers cut out the valley, and before the Yordedales were laid down on top of this lot (even though they have now been bulldozed away) this will have been the bed of a tropical sea. Just imagine ..... a crab (if indeed they did exist at the time in this area) would have been able to crawl right across the limestone on this photograph without falling down any hole in the middle. I wonder indeed what swam about where the sky now is???? A better view of the cairn, I think - with contrasting shadows. The abrupt end of the dale seen on the left marks the position of the Craven Faults. Notice how the massive bed of Great Scar Limestone is not level, but dips slightly to the right of the photograph. It effectively follows the incline of the basement slates which lie below, and are over 500 million years old. Some of the exposed limestone on Southerscales Scar is beautiful indeed in the way it contrasts with the greens and sombre tones of the landscape beyond. Hidden in the trees at centre are the famous holes of Hurtle Pot and Jingle Pot, with the magnificent Weathercote Cave lying beyond. What was that they said about Chapel-le-Dale? Notice how the Yoredales on Whernside have dull, grey-green slopes as opposed to the emerald grasslands so typical of the Great Scar Limestone in the centre. Turning up through the Southerscales area towards Ingleborough, we encounter another wonder - the incredible doline of Braithwaite Wife Hole. Seeing the ground just fall away into this monster can even stop the Three Peaks Marathon walkers in their tracks. Many holes in the area are asociated with wives: Batty Wife and Tatham Wife are also in the area. The stories go that wives were thrown into these holes when they annoyed their husbands!! Ladies of the 21st century might well have a desire to reverse the trend ... !! The hole is 60 metres (180 feet) across and at least 25 metres (80 feet) deep. It is believed to have been formed by collapse due to erosion of the limestone underneath, and there were once entrances into the nearby Sunset Hole cave system that have since been blocked. What we are seeing here, in fact, is the remnant of what was once an even larger hole, but which has been filled in by glacial debris and trimmed a few metres at the surface by the ice as it scoured the benches. It therefore even predates the last glaciation and is a very ancient feature indeed. It is usually quoted as the biggest 'shakehole' in the country - but there are many other lively contenders. Braithwaite Wife Hole with its parent mountain, as ever, watching over. The emergence of the Lower Sunset stream cave close to Braithwaite Wife Hole. This is on the right side of the path through Southercales, an important reserve owned by the Wildlife Trust. Looking north from Southerscales towards Ribblehead, again giving an idea of the width of the great Chapel-le-Dale glacier and the amount of material removed by ice above the limestone over several glaciations. Instead of continuing on the Three Peaks route up Ingleborough, I took a diversion to the south into an area where you see very few people. This sheepfold is typical of the area, though it looks an uncomfortable place to sit these days ... ! The diversion leads to some superb features. This is Sunset Hole, one of the best 'novice' caves in the area, though it does have its share of challenges in two small waterfalls - needing ladders or rope, and a final 'big pitch' of 15 metresinto a chamber, very close in fact to the huge crater of Braithwaite Wife Hole. This is the 'dry' entrance, with the stream sinking at another hole just above - but a couple were having their dinner there and I didn't want to disturb them. He was reminiscing to his better half about the days when he flew down this hole, and I can well remember my first trip down here. Lovely name for a cave, isn't it? Another view of Sunset Hole. It should be treated with great respect and is notoriously dangerous in flood, when the cascades become impassable underground. Despite the gentle name, it can be a monster. It is, however, easy for intrepid walkers with wellies and a good torch to go as far as the first waterfall and enjoy a little bit of the Ingleborough underground. Just choose a good day .. and dry off in the sun outside in as perfect a place to dine as you can imagine. As with all the caves, it has formed where a stream has flowed off the Yoredales onto the Great Scar Limestone, and sunk into the nearest available joint. And how about this one? Gollum's Cave, which lies nearby, was once covered in iron sheeting to protect sheep. It leads into a very tight little bedding passage and is not for ordinary mortals. Got that , my precious? The ditch was first dug in 1910 and apparently still works today. You can trace it as it curves like a snake down the drift-covered surface. My first view into the depths was the stuff of fairy tales: ferns, scabious and a gorgeous red admiral. The north west corner of the hole, at the far side of the rift, is like a hanging garden. Water can be heard entering below, and there is a glimpse of The Mere itself. The Mere is actually spanned by a huge bridge of rock, though this is not at first apparent from the surface. The grassy saddle you can see here is actually that very bridge, with a notable dip in the middle. I recall a visit one hot summer day when The Mere was 'down' to the extent that cavers could have great fun passing beneath the rock bridge in a dinghy! Most fantastic of all is the scramble down into the gully at the south-east end. There at first appears to be no access, but sliding under the low tree branches leads to a slippery ledge with a useful parapet to prevent you falling into the depths. For the ordinary walker with an intrepid nature, this is one of the great experiences on Ingleborough. Here you are alone with nature at its most raw and forbidding, yet it is strangely beautiful. Meregill Hole is just an awesome spectacle. 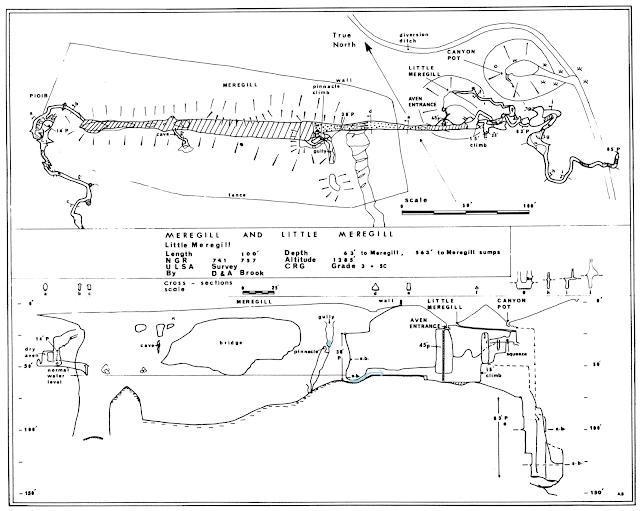 On this survey of Meregill Hole, there are two splashes of blue on the lower diagram. The upper one shows my position in the gully - while the lower shows how the water level usually blocks off the gravel slope leading into the cave passage. A quick look will see the passage leading to a series of shafts which the Yorkshire Ramblers Club first explored. You can see why diverting the stream was a wise decision. At top right, the more recently discovered routes via Little Meregill and the Aven Entrance effectively by-pass the 'sump' - as flooded cave passages are known. An unusual feature of Meregill Hole is that the water course initially heads back into the heart of Ingleborough, instead of westwards as would be expected. It is a humbling experience to wedge yourself into the gully and see Meregill Hole. Like everywhere on Ingleborough, it requires great care ... but then, so does driving here ... I am not not recommending this move in any way, but it's the one and only way to see the drama. The stream bed above Meregill Hole has many old tree roots embedded into the peat. 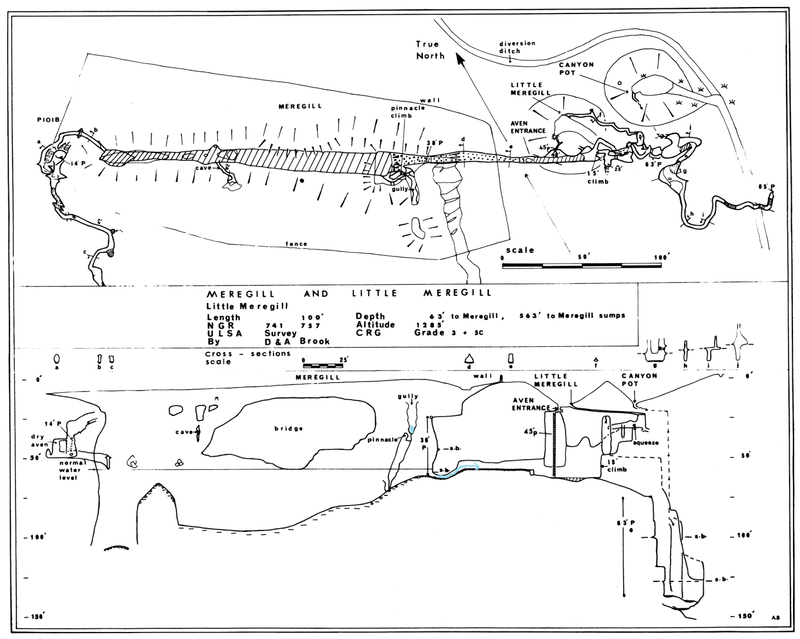 The Aven Entrance is, in effect, an all-weather route into Meregill Hole. Many cavers go in this way, down an underground pitch, and proceed down the Meregill Hole shafts without having to worry about the sumping lake. Perfect weather is, however, essential. Even with the stream diverted, flooding will breach the dam and cause impassable conditions below! Even the Aven Entrance itself is beautiful. The innocent looking lower end of the Meregill Hole rift. For many years it was, with its series of underground pitches, the deepest known pothole in Britain, an incredible 181 metres into the bowels of the earth before meeting totally flooded passages (sumps) that eventually emerge at God's Bridge. This is what the Meregill stream does in normal conditions. Like so many streams in limestone country, it simply vanishes into its bed just before the pothole. The stream, moving over glacial debris, disappears as soon as it meets the limestone into the shingle-choked Meregill Cave. Leaving Meregill at last, this great view of Ingleborough presented itself, with the forbidding cliffs and landslips known, splendidly, as The Black Shiver. The Black Shiver, in close-up. A gully cuts straight down the middle. Imagine tackling that! This is the steepest part on any of the Three Peaks. It's then a case of picking your way along some of the greatest limestone pavements in Britain, keeping a prominent cairn on Raven Scars in the line of sight. The pavements were originally formed beneath soil cover. The Yordedales once lay on top, as can be seen by Whernside and Gragareth here, remnants of that once extensive cover that has been removed by ice and water action. A full circle of gleaming white rock. Whernside soars over the Great Scar Limestone on the opposite side of the valley. Looking north to the far reaches of the Ingleborough massif, with Southerscales Fell and Park Fell prominent. Again, the massive width of the glacier can be imagined from this photograph. The Ribblehead viaduct can just be glimpsed in the far left distance. Closer to the edges of the valley, the limestone is more broken and worn down by the concentrated scouring of the glaciers. The clints are more difficult to walk upon. Harry Hallam's Sheepfold, so named for generations, is backed by a tremendous natural amphitheatre, where the upper cliffs of the mountain - the arks of Ingleborough, connect with the satellite of Southerscales Fell above the enclosed moorland of Humphrey Bottom. Look carefully on the pavements and there are all kinds of fascinating remains of shelters. It must have taken some strength to raise this boulder, which appears to have been shaped for its purpose. Looking west from the same spot couldn't be of greater contrast. Gleaming white rock on the edges of the Raven Scars, with Twisleton Scars beyond. There are many cairns in this area to keep explorers safe when the mist descends. Wainwright states that the plateau is rarely covered in mist - but don't you believe it! The classic view of a great mountain: a cap of millstone grit, with the rugged slopes of the Yoredales - all resting on a beautiful plinth of Great Scar Limestone. Geology has been done to perfection here. Peering down the Raven Scars for the first time, into the base of Chapel-le-Dale. The waters from the caves on this flank have emerged at God's Bridge (just off the picture to the right) and are flowing along a slate bed as the River Twiss. It was on the far side of Twisleton Scars, up on the left, that a certain Chrisopher Francis Drake Long sat with a pair of binoculars in 1923, picking out an emerging spring on this side and, in doing so, uncovering the secrets of White Scar Cave. Whoever built the splendid cairn on the top of Raven Scars deserves an award. How wonderful does it look with Ingleborough behind? Wainwright simply labels it, 'the cairn of a professional.' You rarely see another soul here. It will be yours to keep. Check this out for a butty stop! Dream on, Stephen, me lad .... dream on ... ! Heading to the edge of Raven Scars and looking back at the cairn, a totem pole on Ingleborough's wild west. Descending the Raven Scars. At this point I was thinking I was a little mad, having to slog it back up there and then straight up the side of a mountain. Scree aprons, typical of the upper reaches of the Great Scar Limestone. The beautiful Raven Scar Cave is very difficult to locate - which is just as well. It is an important archaeological site. In it were discovered the remains of 21 skeletons: just the arms, hands, legs and feet. It is not known whether the torsos were removed or if the smaller remains of disintegrated bodies were 'swept up' and placed in the cave. Animal remains, including that of a bear - have also been uncovered, as well as flints, and objects which may date back as far as the Palaeolithic, though this is a matter of debate. It is a unique cavern with a soft calcite floor - very delicate and best not disturbed. By standing on a rock so I wouldn't disturb the floor deposits, I was able to photograph the interior. Peeping out from just inside the cave entrance - as the bear would have done. Superb rock sculpture on the very edge of Raven Scars, as I began my climb back to the plateau. You don't get chance to notice all this lovely rock sculpture from the road through Chapel-le-Dale. Stunning rock scenery, looking north along Raven Scars. A convenient breach in the upper section of the cliffs, where a fault cuts through the rock strata. Boulders are often of gigantic proportions. I call this 'The Hungry Caterpillar'. See him? He just needs the antennae, but there is a little smile I can see. The breach in the cliffs is actually the line of the Green Edge Fault, a minor fault that nevertheless has a great effect on the landscape. Notice the settlement remains on the plateau? 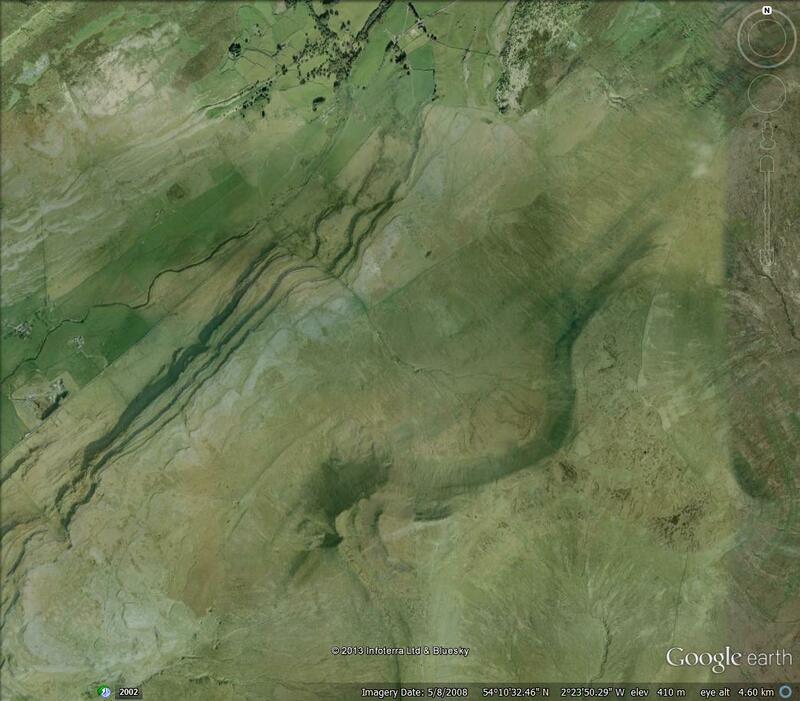 There is also a superb full length view of Whernside here, above the Twisleton Scars. Back on top, and peeping along the line of the Green Edge fault to the Falls Foot Landslip - our exciting route to the summit. Notice it, as a huge 'bite' taken out of the mountain? Heading along the groove of the Green Edge Fault, with ever more impressive views of the Falls Foot landslip opening up ahead. Looking the other way along the Green Edge Fault scarp.clearly showing the uplift of the Great Scar Limestone on the left, and the 'downthrow' of the rocks to the right. The fault is handy in mist as it leads straight as a plumb line to the valley bottom. As the Yoredales on the left are now clearly lined up with the Great Scar Limestone on the right, water effectively rushes out of the thin Hardraw Limestone of the Yoredales and then vanishes into the Great Scar down a significant joint, forming the superb Tatham Wife Hole. I don't know who Mr Tatham was, but he was a swine if he threw his wife down this one! Geology exposed for all to enjoy. The water comes straight out of the Yoredales on the left, and immediately drops into Tatham Wife Hole: a classic caving trip with underground falls and pitches. The entrance to Tatham Wife Hole. It's a great trip requiring ladders and ropes, and is not too tricky when you are with the right people. As with all potholes, it is a different story in flood. Tatham Wife Hole, in its position along the fault scarp of Green Edge, which shows up well in this photograph, looking west. Looking up at the next objective - Fall's Foot, where a massive slice of the Yoredale Series has slumped down the mountain, influenced by the Green Edge Fault. It is, in many ways, the 'Lord's Rake' of the Three Peaks. 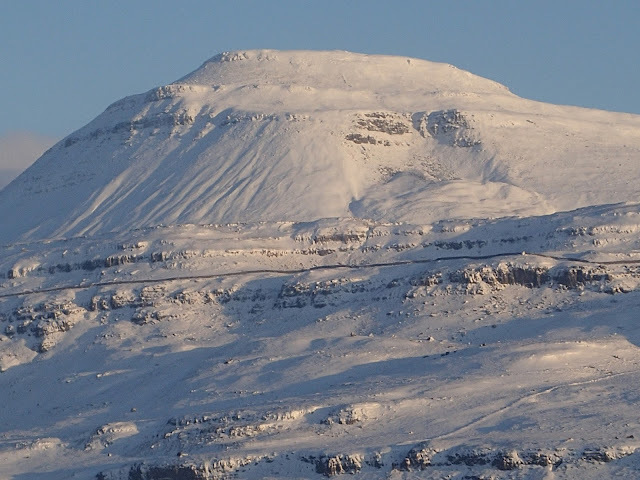 How about this for a shot of the Falls Foot landslip, standing out brilliantly in the snow. This was taken using zoom from the opposite side of the dale on Scales Moor. Thanks, John, for sending me this great photo. Roll on winter!! Massive blocks of sandstone and gritstone have cascaded down the mountain. This is one dramatic spot. I love this: peeping through the sandstone blocks to the plateau of limestone, hundreds of feet below, now. It's like being in a plane. It's a great feeling. Desperately grabbing a few more shots as the cloud threatens to smother me. The upper reaches of Falls Foot. Rock scenery on a dramatic scale. I'm not going to be able to see that lovely summit. Who would have imagined that half an hour ago ... ? Vump! The end. Mighty Ingleborough disappeared beneath a cloud of driving rain. I could see ten feet in front. Oh, well, we can't have it all. I couldn't - because I couldn't even see them!! Leave a descent to the imagination - especially if you are male. They were one of Wainwright's favourite places - a green and white oasis on the barren moor. And emerging half a mile away at this quite wonderful spot. I'll take you through another day. Ooh lovely! It seems I have only just begun my journey on Ingleborough! I'm a Lancashire lad with a passion for exploring and writing about the wild places of Yorkshire.